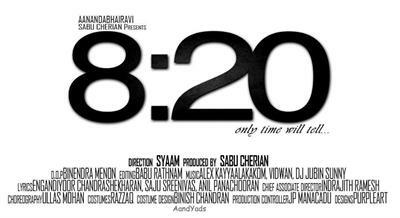 Get ready to welcome a suspense thriller in malayalam which is gearing to be a trend setter. 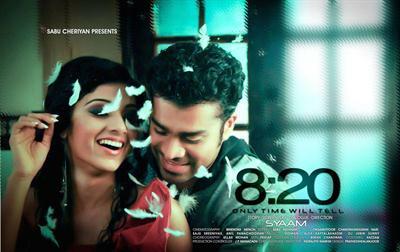 Sabu Cherian who introduced a new genre of movie starting with For The People is yet again back in business with a new generation experimental movie titled '8.20' which have melodious songs, romance and all the flavours which make it a 100% entertainer. Being the directorial debut of Shyam Mohan, 8.20 can be considered to travel through the path just as 'For the People' did years ago. The movie was a blockbuster even though fresh faces were handling the lead characteristics. 8.20 is being made keeping in mind of the young generation who are passionate to those enjoy those movies which are packed with suspense and carries thrilling moments. The story develops from an incident which happened in a split second between 8.19 and 8.20 of a day. The highlight of this thriller will be the involvement of Bollywood fame Binendra Menon who will be handling cinematography of the movie while the movie is being shot using Alexa camera. Another interesting fact is about the song 'Thoomanjin Kulirilo' sung by Sonu Nigam with Arjun and Avanthika Mohan romancing was done in a one shot using vice camera, introduced for the first in South Indian movie industry. It would be much thrilling to know that GhostRyderz, India's number one Bike Stunners who will be appearing in the promotional song and also a college song too. 8.20 to be produced by Mr. Sabu Cheriyan (Chairman, KSFDC) under the banner 'Aananda Bhairavi' is finally out of Studios and would reach theatres soon. Other than hero Arjun (Casanova and Grand Master Fame) and heroine Awantika Mohan ( Yakshi Faithfully Yours), the movie will be blessed with the presence of Vijayaraghavan, Biju kuttan, Jayakrishnan, Poojapura Ravi,Jagadish, Prasad, Kalabhavan Narayanankutty, Reshu Rengaswamy and Sreeya Iyer. For the lyrics of Engandiyoor Chandrashekharan Nair, Anil Panachooran and Saju Sreenivas, the music has been set by Alex Kayyalaykakkom, Vidwan and DJ Jubin Sunny.